My graduate advisor, Stirling A. Colgate, passed away last weekend. He was a colorful character, president of New Mexico Tech from 1965-1974, and physicist at Los Alamos National Laboratory. Here we see him as he appeared in the PBS Nova episode “Death of a Star” which was filmed around the time I worked for him. In the background is the Digitized Astronomy Supernova Search Telescope that he developed and I worked on for two years. Perhaps Stirling’s most famous contribution to astrophysics was predicting that there would be a neutrino burst during a supernova explosion. This idea was borne out by the explosion of Supernova 1987A. Stirling once told me that the reason he went into physics was that he enjoyed watching things explode. Of course supernovas are the biggest explosions in the universe. One of Stirling’s other major accomplishments was his attempt to build a supernova search telescope. He started this telescope in the 1960s, during the era when astronomers sat out in the dome with the telescope, often taking photos on glass plates or counting photons with photoelectric photometers. Stirling’s supernova search never worked as hoped, but the papers that came from the project helped to drive further development in robotic and automated astronomy. It paved the way for remote operation of telescopes. This in turn allowed for better image quality, because astronomers didn’t have to be out at the telescope. It allowed for real-time analysis of data, because astronomers could use a computer to collect data and look at it at the same time. What’s more, because of this work, astronomers don’t always have to travel to the telescope that’s collecting their data, they can work over the internet. Among other things, this work allowed for the development of robotic space-based telescopes such as the Hubble Space Telescope and Kepler. 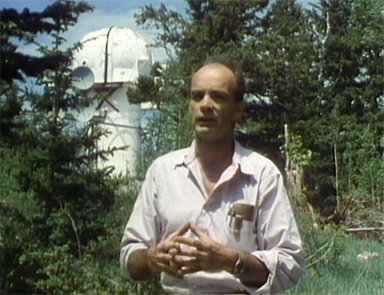 While I was working for Stirling in 1989, William Fowler came to give a lecture at New Mexico Tech. In 1983, Fowler won the Nobel Prize in Physics for theoretical and experimental studies of the nuclear reactions of importance in the formation of the chemical elements in the universe. Fowler had also been one of Stirling’s postdoctoral advisors. The three of us, along with Stirling’s wife, Rosie, sat around a table in Socorro’s Capitol Bar, shooting the breeze. I remember Stirling turning to Willy Fowler and asking what he thought about recent studies that showed the possibility of global warming. Fowler said if it bore out, it would have tremendous impact. It’s amazing to me that over twenty years later, we’re just starting to see the scale of the impact. Unfortunately, over the years, Stirling’s work and mine carried us in different directions. It has been a while since I’ve had a chance to communicate with him, but he still sticks with me as an important and influential teacher. He taught me how to solder electronics, how to read an oscilloscope and how to repair cryogenic systems. He taught me about the physics of exploding stars and he taught me about statistical analysis. He taught me to always ask why things work and not just how they work. Free of his mortal coil, I picture Stirling in a swimsuit, waiting to dive into a distant supernova and ride the waves of the explosion as far they’ll carry him. This entry was posted in Astronomy, Remembrance and tagged astronomy, explosion, Kepler, Nobel Prize, science, Stirling Colgate, supernova. Stirling was my uncle and wonder if you are going to his memorial this Sunday Dec. 15 , in Los Alamos. We live in Hawaii and he visited often. My wife and I visited them in September and we thought he was in fine health. Not as quick as in his youth after a bout with pneumonia. While his offspring would love to have us there the options for my mother, Stirling’s sister Anne, are remote. The family will come out to visit us. If you are at the gathering please let me know of the proceedings and photos if any. Mahalo. Condolences on your loss, Warner. The news certainly came as a surprise to me. Unfortunately, my work schedule prevents me from making the trip to Los Alamos on Sunday. I’m supporting a speckle interferometry run on Saturday night and helping to commission a new spectrograph on Sunday night — and this time of year, several of my co-workers already have vacation in the pipeline. I’ll drop a note to a friend who I suspect will be going if he’s able. If so, I’ll see about putting you in touch. Best wishes. Is it true he invented a form of time travel called plasma confinement? I am thrilled to be once again be introduced to my uncles work. While we visited him and his daughter shortly before his passing we knew little of his prior accomplishments. He had walked me through the atomic museum in Los Alamos And told me stories of different programs he was part of shown there. We had a good time as Rosie and my wife were less interested in the past and got into the present. They were gracious and we were sad he left without future visits. We are in more contact with their offspring and are visited in our homes. I wonder why this email and story are now being sent but thank you for the thoughts. May the memories of great and small events keep you as well. Hey there thanks for answering my question,would love to see a good book written about him. Hi Warner – I’m guessing you had “Notify me of new comments” checked and Mr. Sawyer’s comment and my reply probably sent you new messages. Stirling walked me through the atomic museum as well. That was a real treat. Hope this finds you well. Steve – I agree. It would be great to see a good book written about Stirling. Kimo – like you, I’m a big believer in alternative energy, but I’m afraid it’s not my specialty. My background is astronomy and variable stars (which of course includes supernovae, one of Stirling’s interests).